Represented as an ‘Emblem of Prayer’, Frankincense is yet another Biblical oil that brings you close to heaven by appeasing your mind, relieving your pain, strengthening your positive emotions and implanting enormous beauty benefits. Extracted from the gum or resin of Boswellia frereana tree by steam distillation, Frankincense essential oil is often held high for its power to spread health and heartiness in a magic of minutes, just like that. Ayurveda quotes the use of Frankincense as ‘dhoopan’, and burning Frankincense everyday in homes is trusted to bring good health in Indian culture. Known as ‘Dhoop’ in Sanskrit, Frankincense and its essential oil have been used for more than thousands of years in Ayurvedic healing in the treatment of respiratory illnesses, arthritis, weak female hormone system, rheumatism, skin infections, wounds, womanly problems and for cleansing the air. Frankincense is represented as a ‘symbol of the divine aroma’ and as an ‘emblem of prayer’ in various chapters of the Bible including Psalm 141:2; Luke 1:10 and Revelation 5:8, 8:3. Best known as one of the three gifts gifted to Infant Jesus by the wise men, the existence of Frankincense dates back even before the birth of Jesus Christ. Given the credit of the most spiritual oil of the Middle East, it has flawless healing benefits with an inbound immaculate aroma. People of all religions consider Frankincense as a symbol of sacredness and it is witnessed with the presence of this mesmerizing fragrance in various religious ceremonies. Frankincense is an important symbol of trading carried out in Arabian Peninsula and North Africa for more than 5000 years ago that the temples of the ancient Egyptian Queen Hatshepsut are adorned by murals depicting sacks of Frankincense traded from the land of Punt. Prepared from the resin of Frankincense or olibanum trees by steam distillation method, this oil is a part of the traditional medicinal system including Ayurveda, Traditional Chinese Medicine and in certain other folklore remedies in treating wounds, arthritis, digestive disorders, rheumatism, and weak immune system and in promoting healthy skin. Frankincense has its name etched in Naturalis Historia by Pliny the Elder. The renowned book on ‘Ayurveda and Aromatherapy’ by Bryan Miller and Light Miller quotes the use of Frankincense since ages as “Clay tablets, revealed that, in Babylon, 57,000 pounds of Frankincense were burned every year.” It also says that about 60 tons of this aromatic resin was used in the annual feast of the God Baal in the Assyrian civilization. Since ancient times, Frankincense is burnt in homes for keeping away from insects, cleansing the atmosphere, warding off sickness and evil spirits and to help reach one’s prayers to the Divine. This holy herbal medicine is burnt even today in numerous Indian homes during the dusk to fulfill their special prayers and guard against bad spirits and harmful insects. According to the Gas chromatography report, Frankincense oil consists of 9 major chemical components that contribute to its unique fragrance, therapeutic properties and quality. For learning more about the extensive information of these chief constituents of Frankincense oil. Alpha-thujene is the predominant constituent of Frankincense with about 53 % area. 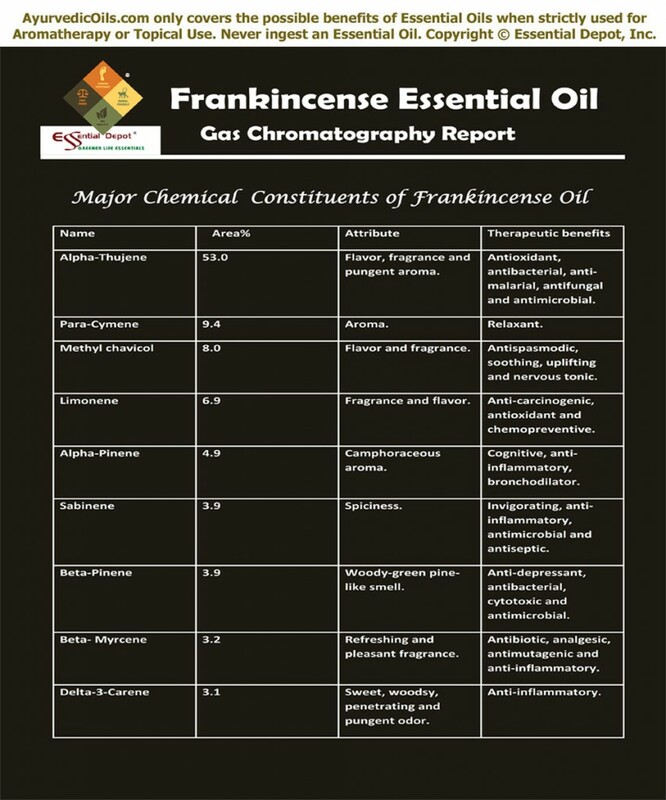 The table below on the Gas Chromatography report talks about the principal chemical constituents and its role in granting the therapeutic and other attributes to Frankincense oil. Studies on the chemical composition of Frankincense oil reveal that it contains monoterpenes, sesquiterpenes and diterpenes such as a-pinene, b-pinene, isoterpenolene, a-phellandrene, b-phellandrene, sabinene, linalool, octanol, octyl acetate, bornyl acetate, incensole and incensyl acetate in different ratios depending upon the species of the Boswellia trees from which the resins are obtained. Frankincense oil is commonly used for its aromatic, antiseptic, astringent, antibacterial, anti-inflammatory, anti-cancer, anti-tumor, immune stimulant, disinfectant, carminative, cicatrisant, cytophylactic, digestive, diuretic, emmenagogue, sedative, tonic, uterine, vulnerary and expectorant properties. Ayurveda is an ancient healing science that focuses on longevity and healthy aging through prevention of diseases and a balanced lifestyle that assists in being in harmony with nature. Ayurvedic healing methodologies were strongly implanted to the human civilization by the powerful Ayurvedic encyclopedias namely Charaka Samhita and Sushruta Samhita. With this thought, Ayurveda regards human body as a temple, where the spirit dwells in and keeping the mind and body clean without any physical illnesses or mental chaos is the way to harmonious living. The science of Ayurveda rests on the principle of five elements of nature namely fire, water, earth, air and space. According to Ayurvedic philosophy, everything in the universe is a part of nature and contains all these five elements in it. Human body also consists of these elements in the form of biological energies known as doshas, in various forms so as to represent a unique individual constitution. Vata dosha represents air and space and is responsible for circulation, nervous functions, respiration and movement. Kapha dosha is a combination of water and earth and is in charge of the structure of the body along with its sustenance. Pitta symbolizes fire and water and is responsible for body temperature and metabolic functions. Balance between these doshas indicates health and imbalance leads to illnesses. Ayurveda recommends natural remedies like essential oils, herbs, yoga, physical exercises, healthy balanced diet, Ayurvedic routine, meditation and prayers in order to treat these doshic imbalances and treat the illnesses by analyzing its root cause instead of diagnosing its symptoms. Frankincense is said to have a sattvic or cleansing effect on the mind as well as the nervous system. It assists in burning impurities in the subtle nerve channels. The essential oil of Frankincense clears excess kapha and pacifies vata and pitta doshas. Frankincense essential oil is an exceptional gift of nature that serves as an antiseptic, disinfectant and immune stimulant. Just inhaling the invigorating aroma of this supreme oil by adding 2 drops of this oil to your burner or diffuser, helps build a protective aura around yourself and acts as a shield in fighting against germs and disease causing microorganisms. A 2002 study on the chemistry and immunomodulatory activity of Frankincense oil conducted by the department of Pharmacognosy of Mansoura University, Egypt states that Frankincense oil exhibited immuno-stimulant activity in addition to its anti-inflammatory, immunomodulatory and anti- leukotriene properties. This study encourages the utilization of Frankincense essential oil for several auto-immune disorders. The number of leukocytes in the human body determines the strength of the immune system of an individual. Inhaling the fragrance or using Frankincense essential oil in a massage blend (5 drops of Frankincense oil added with 2.5 ml coconut oil) increases the production of leukocytes in the body with its cytophylactic property. 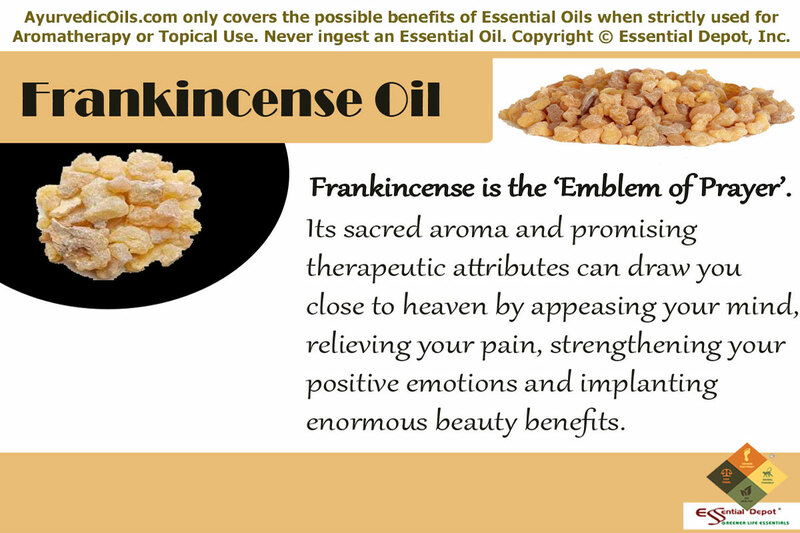 Frankincense essential oil has anti-tumor and anti-cancer properties, the attributes of monoterpenes that effectively helps in fighting against the cancerous tumors. A 2012 research on Frankincense essential oil prepared from hydro distillation of Boswellia sacra gum resins has proved that this oil induces human pancreatic cancer cell death in cultures. It also reverses tumor growth in a heterotopic xenograft mouse tumor model. Studies have also reported that cultured human bladder and breast cancer cells are more sensitive to Frankincense essential oil and yield good results. As a very good source of β-phellandrene and α-pinene, Frankincense essential oil acts as an effective carminative and helps in preventing and expelling the formation of gas in the stomach and intestines. It also acts as a natural antacid and promotes the secretion of bile and other digestive juices. Mix 2 drops of Frankincense oil with 1 ml sesame oil and massage this blend on your abdomen for relieving flatulence, constipation and other gastro-intestinal problems including stomach pain, feelings of discomfort in the chest and abdominal area. The antiseptic, antibacterial and antifungal properties of Frankincense oil acts as a defensive shield that protects one from germs, bacteria, pathogens and fungi. This defensive mechanism of Frankincense essential oil makes its presence vital in making dental care products like toothpaste, mouthwash, mouth freshener etc. Add 1 drop of Frankincense oil in a cup of warm water and use it as a natural gargle to keep away from oral problems like toothache, bad breath, cavities, mouth sores and few other oral infections. Frankincense essential oil often evolves as a perfect rescuer in case of skin problems as it acts as an effective astringent, which helps in retrieving its natural beauty. This oil works on wrinkles and other aging symptoms with its ability to shrink the body tissues and bring it back to its original shape and assist in tightening the skin. As a cicatrisant, it helps in the formation of scar tissue and yields excellent results in treating scars, fading the after marks of acne, pimples, boils, pox, stretch marks and fat cracks due to pregnancy and childbirth. Add 2 drops of Frankincense essential oil with 1 ml of jojoba oil or to your regular skin care cream and apply it in circular movements to reduce the appearance of wrinkles, scars, marks and micro-wrinkles around the eyes and cheeks. As an anti-aging agent it helps in the regeneration of healthy cells while keeping the existing ones healthy. Because of its firming and toning activity it strengthens the gums and hair roots and contracts the muscles, intestines and blood vessels that loosen with aging. 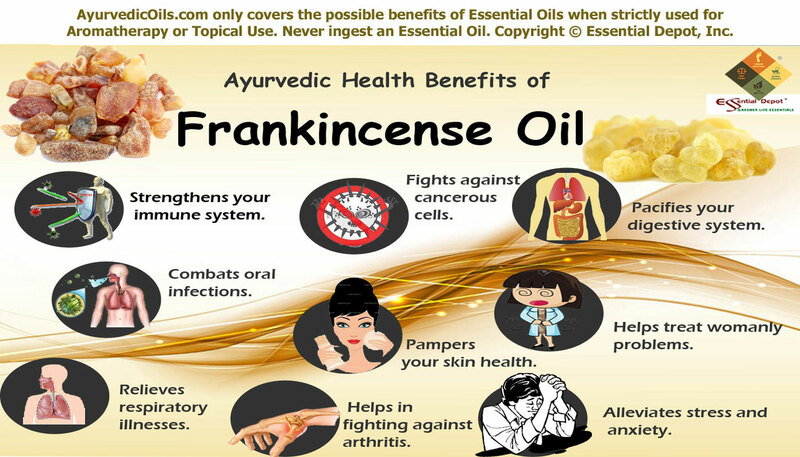 Frankincense oil acts as a coagulant and helps in preventing blood loss in case of wounds and cuts. It also assists in healing wounds and other skin infections speedily. Frankincense oil acts as an emmenagogue that stimulates the flow of blood in the pelvic area and the uterus, thus regulating the menstrual cycle and functions of the female reproductive system. It is also uterine in nature and regulates the secretion of estrogen hormone in the appropriate level, thus reducing the risk of cyst formation or uterine cancer in women. Add 2 to 3 drops of Frankincense essential oil with 1 ml of Evening primrose oil and massage it slowly on your lower abdomen for relieving problems associated with menstruation like abdominal pain, nausea, digestive disorders, restlessness and mood swings. You can also add 2 drops of Frankincense oil in warm bathing water for calming your nerves and promoting peaceful sleep. Stagnation of water, toxic substances and infectious micro-organisms in the body pave way for respiratory problems. This is mainly due to excess of kapha dosha and Frankincense essential oil lessens excess kapha. This oil also has antiseptic, anti-bacterial, anti-inflammatory and expectorant properties that protect one from infectious microbes and helps reduce phlegm deposits in the respiratory tract and inflammation of the nasal and respiratory passages. 2 drops of Frankincense oil added to steam inhalation or mixed with vaporub and applied on the chest, back and throat aids in easing cough, cold, bronchitis, laryngitis, breathing difficulties, asthma and certain other respiratory ailments. Frankincense oil has been used since ancient times to treat arthritis, rheumatism and muscular pain. With its anti-inflammatory, diuretic and kapha reducing qualities, this oil also aids in eliminating excess water deposits, salt, uric acid and toxic substances in the body causing pain, swelling and inflammation. A valuable source states that this oil possesses potent anti-inflammatory, anti-arthritic and analgesic effect that actively treats arthritis, osteo arthritis and pain in muscular joints. Mix 4 drops of Frankincense oil with 2 ml of coconut oil and massage it gently on the painful area or you can also add 2 to 3 drops of this oil to hot compress for quick relief. Frankincense essential oil awakens insight, soothes anxiety and frees one from all sorts of worldly pressure that affect the mind and the body. Various studies have proved that incensole acetate in Frankincense oil is an effective anti- depressant and reduces abnormal behaviors due to anger, stress and anxiety. Adding 2 drops of Frankincense oil in your vaporizer, burner or diffuser assists in attaining spiritual enhancement that balances the mind, body and soul to experience eternal happiness. This healing effect can also be attributed to the presence of carbon based compounds like sesquiterpenes that directly act on the limbic system, known as the control center of the human brain. Frankincense essential oil is also used in the manufacture of soaps, disinfectant cleansers, incense sticks, cosmetics, perfumes, body lotions, oral hygiene products and much more. This article is for the purpose of education only and is not intended for treatment or for replacing any prescribed medication or professional medical advice. Never take essential oils for internal use and always use externally in a diluted manner, as organic and pure essential oils are highly concentrated liquids and may cause allergic reactions if used directly on the skin. Always consult your Ayurvedic practitioner before choosing the appropriate essential oil for your unique individual constitution and health condition. The MSDS (Material Safety Data Sheet) of Frankincense oil is readily available for your enhanced safety and healthier usage. 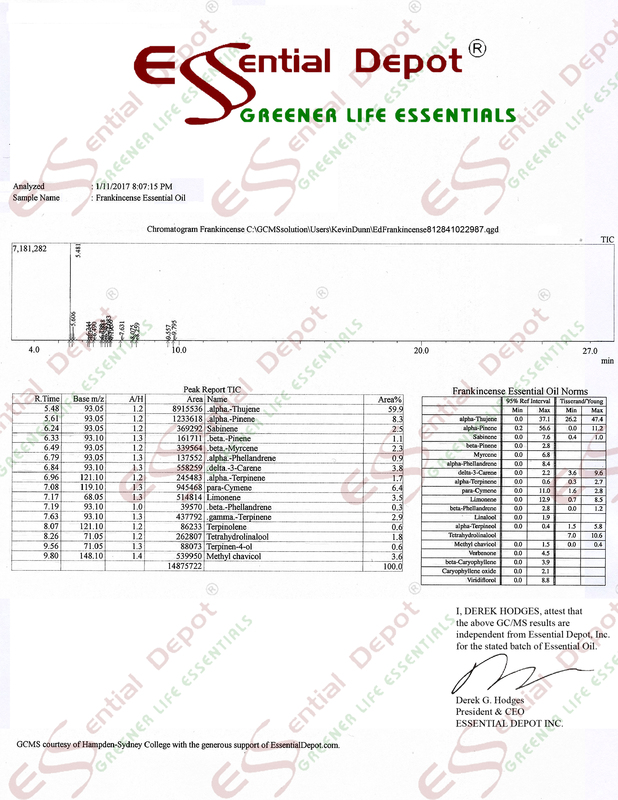 Gas Chromatography Report of Frankincense oil. This entry was posted in Essential Oils - Learn About and Purchase and tagged Ayurvedic health benefits of Frankincense oil, Ayurvedic oils for anxiety, Ayurvedic oils for arthritis, Ayurvedic oils for cancer, Ayurvedic oils for digestive disorders, Ayurvedic oils for immune power, Ayurvedic oils for menstrual problems, Ayurvedic oils for oral problems, Ayurvedic oils for respiratory problems, Ayurvedic oils for skin care, Ayurvedic oils for stress, Ayurvedic oils for uterine problems, Boswellia frereana, Chemical constituents of Frankincense oil, Frankincense in Ayurveda, Gas Chromatography Report of Frankincense oil, Health benefits of Frankincense essential oil, MSDS of Frankincense oil, Therapeutic properties of Frankincense oil by AyurvedicOils. Bookmark the permalink.